Game of Thrones had an unusually slow episode with last week's "The Prince of Winterfell." Not that there wasn't a lot to like in the small character moments (and the four or five times D.B. Weiss and David Benioff decided to drop the C-bomb) but you could definitely feel that the show was mostly set-up with very little payoff. Of course, that's because the writers were doing just that, setting up the climax on the “Blackwater” as the show nears the end of the second season. Do you remember what happened at the end of Episode 9, Season 1? The image is in keeping with the rest of the second season's print promotional material, using the same 'medieval color' scheme of bronze and black as well as keeping the overall design quite stark (pun intended). I really love the way they've used the bold letters and only one or two images to keep the promos simple and pointed. 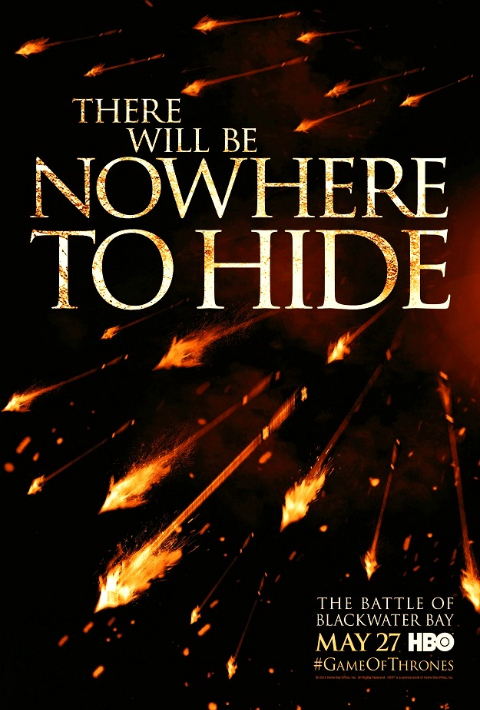 This time, it's all about the fiery arrows raining down from above, blanketing the entire dark sky and reinforcing the typeface, "there is nowhere to hide." Written by the man himself, George R.R. Martin and directed by The Descent's Neil Marshall, this Sunday's episode of Game of Thrones can't miss. Just like those arrows? Episode 9, “Blackwater,” airs Sunday at 9 p.m. ET on HBO. It stars Kit Harrington, Emelia Clarke, Lena Headey, Peter Dinklage, and Nikolaj Coster-Waldau. The show was created by David Benioff and D.B. Weiss, based on the “Song of Ice and Fire” saga by George R.R. Martin.